← Episode 88 – There are only two of us! Without directly managing software on student laptops, sometimes it is frustrating to implement simple standards, such as, which browser should students use. I decided to take the simplest approach possible and consider users on Apple laptops, Windows, and iOS devices. A very common technique when designing a website is to detect the browser, and then load a css style sheet or some other pieces of code that is designed to work with the users browser. Many people do not realize that Internet Explorer, Google Chrome, Mozilla Firefox, Safari, and the versions of those on iOS devices, are different. They have varying standards. When buying services, the service will normally be compliant with the top 3-4 browsers being used. However, when developing internally for multiple browser, as one does for privacy or because they might happen to live in China, is time consuming. Remember, most Ed.Tech people are not full-time developers, regardless of their skills set they simply do not have the time. The script below is running on the schools Drupal content management system. However, it will work on most content management systems (WordPress, Joomla, etc.). And it can be written in other languages using about the same exact logic. This script does nothing when the student is using the correct browser. When they use an incorrect browser, it directs them to a page that kindly reminds them which browser they should be using. The script is easy to beat if someone is determined, but I have found being slightly annoying tends to eventually wear down the majority of users. The goal is to make sure everyone has equal access, and that teachers with a set of instructions can provide some universal support. The script checks for Chrome and various versions of Internet Explorer, so if you love Firefox you need to adjust it. Here is a list of Browser User Agents to support anyone trying to do this. 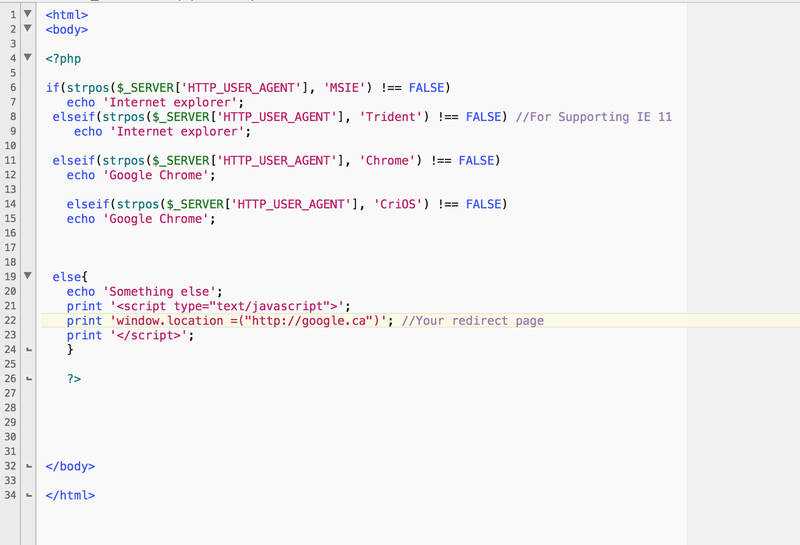 I took all this code straight out the PHP API, it is nothing special or clever. However, it is simple and free, and it is just another way to set standards in an open BYOD environment. This entry was posted in Educational Technology, Helpful Tips, Instructional Technology and tagged Browsers, BYOD, Code. Bookmark the permalink.